I can't bring myself to finish Korra. O-Deck, I've been a bad fan. I have to admit this. I haven't yet watched a single episode of Book 4 of The Legend of Korra, AKA my favorite show on television. Well, I guess it's not on television any more, and that's the problem. It's not that I don't want to watch it, I do, and I've gotten bits and pieces of the series here and there that all sound fantastic (I CAN'T BELIEVE THEY WENT FOR IT) but... I can't bring myself to watch the ending. I'm probably ruining the experience for myself when I eventually man up and watch it, since I haven't been a part of the group viewing experience, but seriously, I'm bummed out over this one ending, especially since (from what I've heard), this is very likely the last Avatar thing we'll get. Ever. Sigh... I don't even know what the point of posting this is. I feel like I'm prolonging the ennui that accompanies a series ending by not actually watching the ending, but this is a big one. The Avatar universe is one of my favorites around, and knowing that it's really coming to an end, likely for good (I've been in denial telling myself they'd do another series until just recently) is really bumming me out. I haven't felt this sad about a series ending since Mass Effect, and even then I intellectually knew they'd wind up making more Mass Effect someday, since that's just how the game industry works. 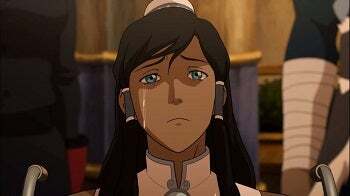 I'm not sure they will ever make more Avatar, especially since Nick unceremoniously ended the series, and that makes me very sad. Yeah. I need to actually do this thing, but I really don't want to run out of Korra to watch.